WCCLS Kids: Monsters of the Deep! For the first time in human history, the giant squid (Architeuthis) has been filmed in its natural habitat, over 2,000 feet beneath the ocean's surface! This marine marvel has been the stuff of legends for countless generations. The "kraken" was believed to be a sea monster capable of dragging whole sailing ships down into the inky depths of the sea. The giant squid was featured in Jules Verne's classic submarine adventure tale 20,000 Leagues Under the Sea, and found its way into many popular films including Clash of the Titans and Pirates of the Caribbean: Dead Man's Chest. Scientists are getting a clearer picture of this fascinating creature. What an exciting time for marine-life enthusiasts! 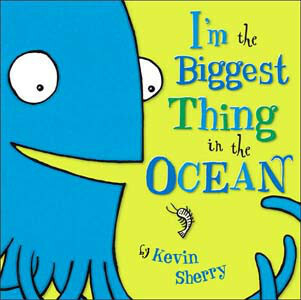 A silly squid shows us all of the things that it is bigger than.. almost! Beginning at the ocean's surface, the reader is slowly taken on a downward journey into the dark depths. Along the way, a wide variety of marine life is discovered. 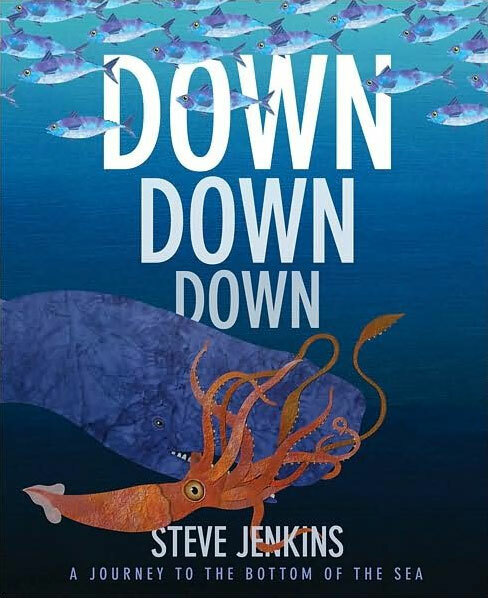 The giant squid shows up at the 10,000 feet mark, depicted in battle with its natural predator, the sperm whale.